One of the most purported cat myths is that dairy milk is good for them. Perhaps this falsity started hundreds of years ago if not as far back as ancient Egypt, originating from the barn cats that would roam around as farmers milked their cows. Farmers would have observed the cats licking the cream from a bucket of milk. Before we started to scientifically question what our pets were given cow milk was thought to be healthy for cats. Cats become lactose intolerant after they are weaned. Lactose, the sugar in milk, is what makes dairy such a problem for humans as well. When a human or cat doesn’t have the proper enzymes to break down lactose into the simpler, more usable compound glucose, the lactose is left to essentially ferment in the stomach. This in turn causes gas and bloating. If you’ve ever experienced this malady yourself, then you know how uncomfortable it can be and you most likely try to stay away from dairy products. While the symptoms of pain and discomfort in a cat may not be so obvious to us their lactose intolerance can manifest in other ways such as diarrhea. Not all cats will be lactose intolerant nor will they all have adverse reactions to milk. However, dairy milk is not a good choice to supplement your cat’s diet. Take, for instance, its calorie load. Milk is high in sugar and will be a source of unnecessary “empty calories” to your cat’s diet. A 15-pound cat requires around 300 calories per day. Feeding high quality treats and cat food is the best way to make the most out of the allotted daily calories. Magnesium is another component of milk that makes it a poor choice for your cat. 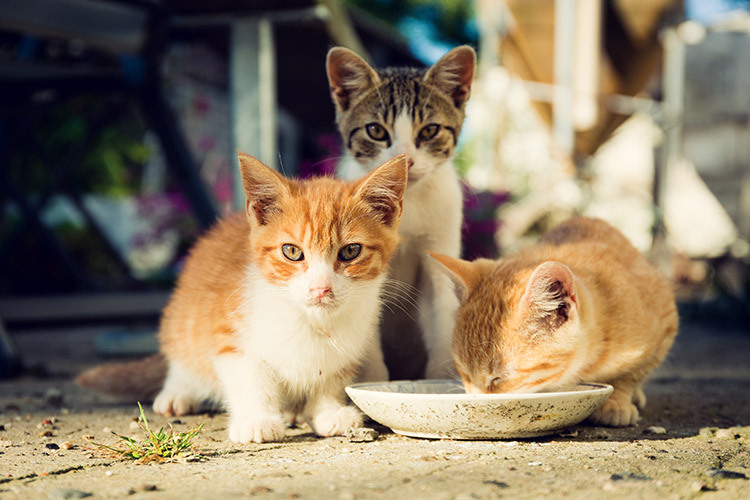 Many cats especially after being sterilized are prone to mineral build-ups in their urine. These minerals can crystallize causing urinary blockages. Magnesium is seen as a culprit in feline urinary tract diseases. Because this metal ion makes up approximately 6% of the average cup of milk adding it to your cat’s diet can either instigate or aggravate kidney and bladder problems. Why Do Kittens Drink Cow’s Milk? Kittens shouldn’t drink cow’s milk either. They should drink their mother’s milk. In the event you are nursing an orphaned litter you would be using a milk replacement formula for kittens. These products contain cow’s milk but it is processed in a way that mimics the nutritional value of the mother’s milk. The fat content is manipulated. Vitamins and minerals important to a developing cat are added to the milk replacer. Taurine is one of the most important nutritional needs of the housecat. Cow’s milk does not contain enough taurine for a nursing kitten. Thus, feeding a kitten dairy milk that has not been processed in a viable form is not suitable. If your cat has developed a taste for milk already, don’t fret! Pet food companies manufacture milk specifically made for our finicky felines without the lactose and with added supplements. No matter how much you love to spoil your cats human-grade dairy milk is not healthy for them!